**This review is going to be somewhat informed by the fact that I read the first two books in the series before writing either review, so I know what happens next and how it all fits together. Because of that, there will be times that I will reference book 2, which I wouldn't generally do, and I am sorry for that, but I promise to try to avoid spoilers. I have to start by saying that I found The Poison Diaries to be really different from other YA books out there, and for the most part, I mean this in a really good way. It's rare to have anything these days that actually feels unique or inventive. The book almost has a magical realist feel to it, which, though a lot of MG and YA books have magic in them, is not a genre often tackled for this age group. There's a surreal strangeness to the writing and plot that I really enjoyed. But whether you do or not, I think you should give it a chance. It's a kickass concept, for which we apparently have the Duchess of Northumberland to thank. She has spent a considerable amount of time and money constructing an epic garden at her castle (uh huh), and this garden includes an ambitious poison garden, which she thought would make a great backdrop to a story and voila! now it is. And as much as you may want to be irritated and find the whole thing pretentious, the thing is, it really does make a great backdrop to a story. 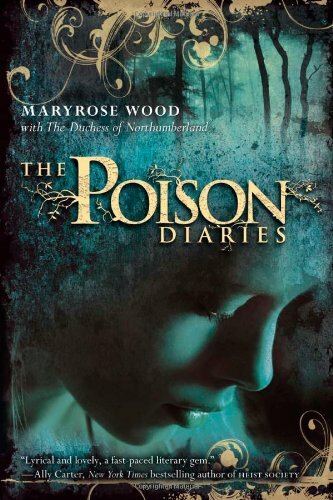 Alnwick Castle, Hulne Abbey and the Luxton's poison apothecary garden makes for a really rich, compelling setting for Jessamine's life to revolve around. And speaking of Jessamine, though I think some of the (very few) characters in the book can be static and one-dimensional, I found Jessamine very interesting and likable. She's sort of charmingly naive, but with a thirst for knowledge and recognition that I thought worked and gave her depth. And in a weird way, I thought the narrowness of the other characters in her life actually aids in her character development, because they were kind of representative of her limited scope and her very confined world. They made interesting counterpoints to her narration and her diary. The diary itself was a little strained as a concept. It felt forced to me, like "The Poison Diaries" sounds like a great name for a series, so we need to work this in somehow. But Jessamine's diary was overkill; it wasn't necessary - her father, Thomas, has a true poison diary that comes into play in a huge way in the series, and was more than enough to carry the name and give it purpose. Very little of the narration actually takes place in Jessamine's diary, and what does could easily be worked into the internal monolgue that makes up the bulk of the book. I felt like the diary bits could have been cut and made the book smoother as a whole, which was something that it especially needed in the end, when the narration is split. But maybe I just over-think these things. The one real drawback for me, though, was the end. As I said, the narration is split in the end, and is...scattered for a number of reasons. The very simple prose of the first 3/4 of the book just sort of unravels and can feel a little chaotic. This is intentional in part, I think, and I can't get too into why without spoilers. But while it may be interesting to have the narration match the chaos of the story conceptually, it didn't quite work for me in practice. The change was too abrupt, and the ending even more so, and the two combined turned me off a bit. I felt like I was tearing through this really absorbing, weird, fast-paced read and loving it, and then it just started to fall apart, and there weren't enough pages left to put it back together. It was weird, because it was the kind of ending that I respect and a part of me likes, but that just couldn't inspire the enthusiasm in me that I wanted to feel for this book when I was done. And this is the part where I reference book 2, because the thing is, I liked it enough that I definitely wanted to keep reading, hoping that book 2 would cast book 1 in a different light and make things work. And it did. It did and then some. But the enjoyment of one book shouldn't be dependent on the next; it always feels like a cheap gimmick to me when this is the case, and it pisses me off a little on principle. And though I don't think the ending was completely a cheap gimmick (because I think it was partly a pessimistic streak in-keeping with the rest of the book, which I applaud), I still can't help but be a little miffed on principle. It's just who I am. The fact is, I liked this on its own well enough, and liked it a lot more on reflection after book 2. Though it's certainly not everyone's cup of poison tea, I think those in the right mindset are going to find it really interesting and memorable, and I promise you, if you're weird enough (like me) and are eager for the 2nd book, the series will impress you. 'Cause Jessamine? She's pretty kickass. Really interesting review for this, I've got it, but it's not something I've felt especially inclined to read. I'm not a huge fan of diary excerpts so that element puts me off, especially when you say it doesn't work well--and not good endings annoy me as well! This will probs stay at the bottom of the TBR pile for now, thanks for the informative review! I think I'll pick this one up from the library, as I'm definitely intrigued, but I do agree that the full enjoyment of book one shouldn't be dependent on book two, as that's usually either a dumb marketing gimmick or bad editing. Thanks for the heads up!